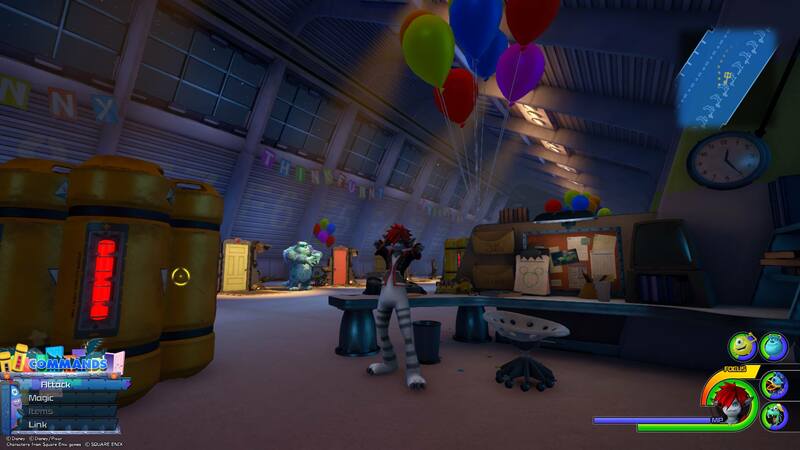 Where to find all 11 Lucky Emblems in the Monstropolis world of Kingdom Hearts 3. 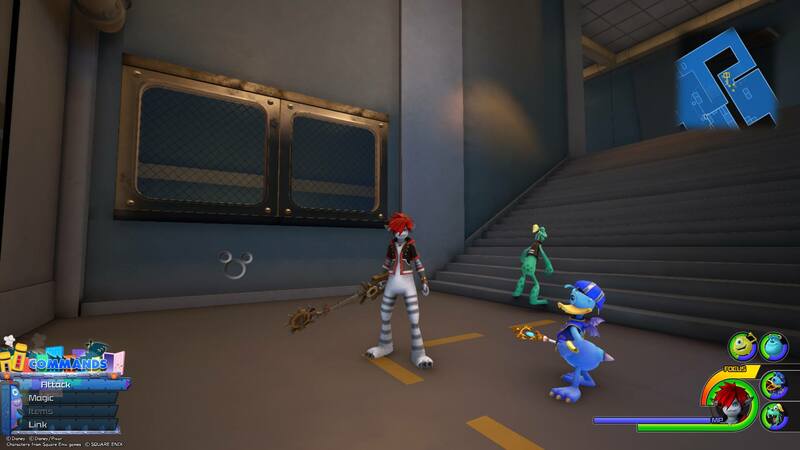 In Kingdom Hearts 3, players will need to find and photograph Lucky Emblems in worlds like Monstropolis in order to unlock the game’s secret video. While most worlds have around a dozen Lucky Emblems to find like Olympus and Toy Box, smaller worlds like Twilight Town have fewer. 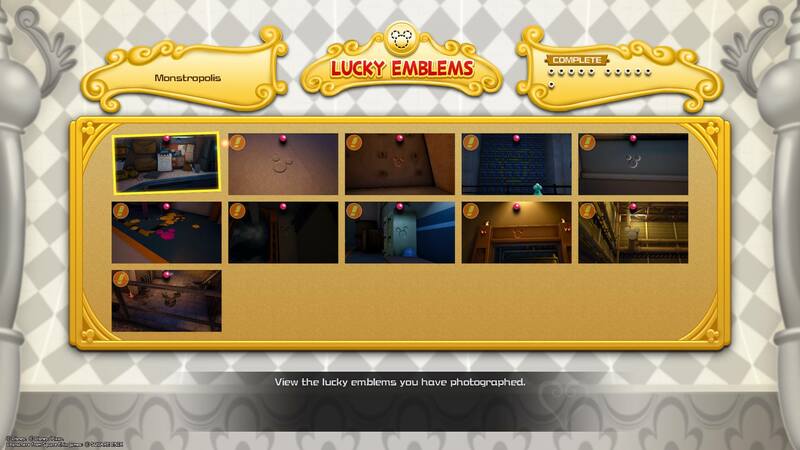 In Monstropolis, there are 11 Lucky Emblems to find in total. Struggling to find one or more Lucky Emblems in Monstropolis? We’ve got you covered! Below, we’ve put together a quick guide on where to find all 11 Lucky Emblems in the Monstropolis of Kingdom Hearts 3. 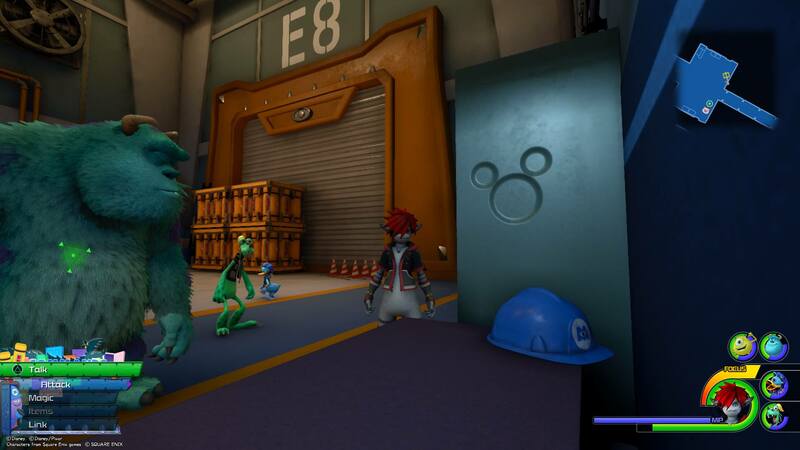 There are 11 Lucky Emblems to find in the Monstropolis world of Kingdom Hearts 3. 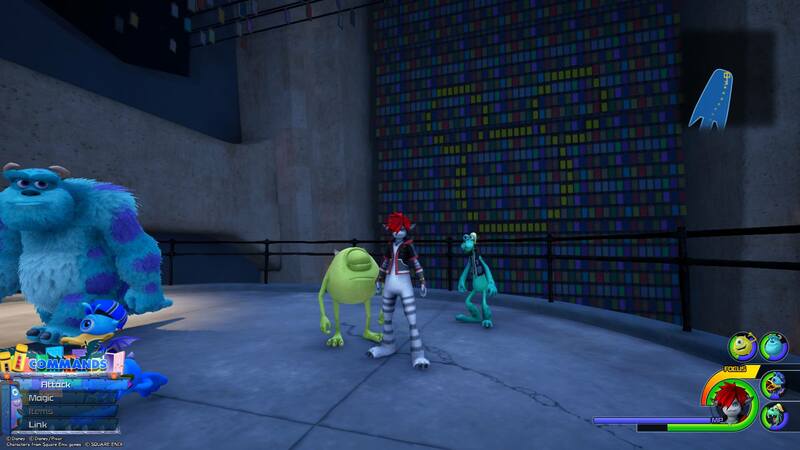 In the Monstropolis world of Kingdom Hearts 3, there are 11 total Lucky Emblems to find. To photograph them, you’ll need to use the camera feature on your Gummiphone. This can be done by pressing the touchpad on your PS4 controller, or the Change View button on Xbox One. After you’ve done this, you’ll need to align the square box over the Lucky Emblem and snap a photo. Note that you can zoom in and out using the left and right trigger buttons if you’re too close, or too far away. Struggling to find Lucky Emblems in Monstropolis? Below, we’ve listed where to find all 11 Lucky Emblems in the Monstropolis world of Kingdom Hearts 3. The first Lucky Emblem can be found by moving this inflatable clown out of the way. 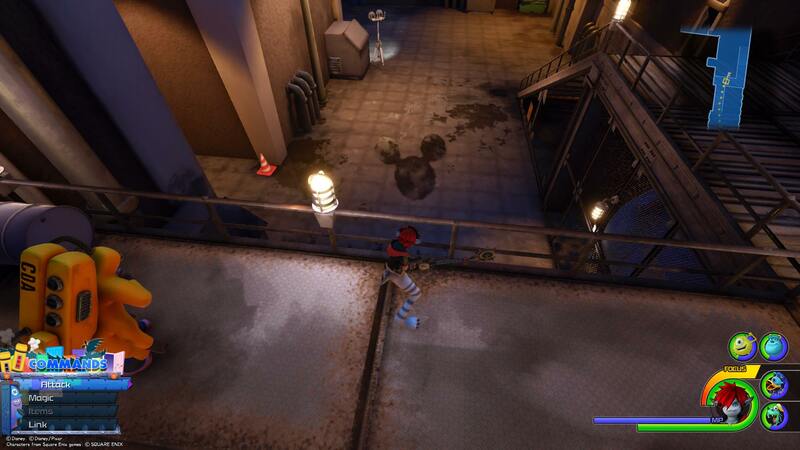 The first Lucky Emblem in the Monstropolis world of Kingdom Hearts 3 can be found on the former Scare Floor turned Laugh Floor. To the right of the entrance door, you'll see an inflatable clown. Push and bash it out of the way to reveal a Lucky Emblem on the floor. The second Lucky Emblem can be found on a desk near the door that takes you deeper into the factory. Before you interact with the door to go deeper into the factory, turn around and look at the desks. On one of these desks, you'll find a Lucky Emblem drawn in green pen on a paper held up by a clipboard. 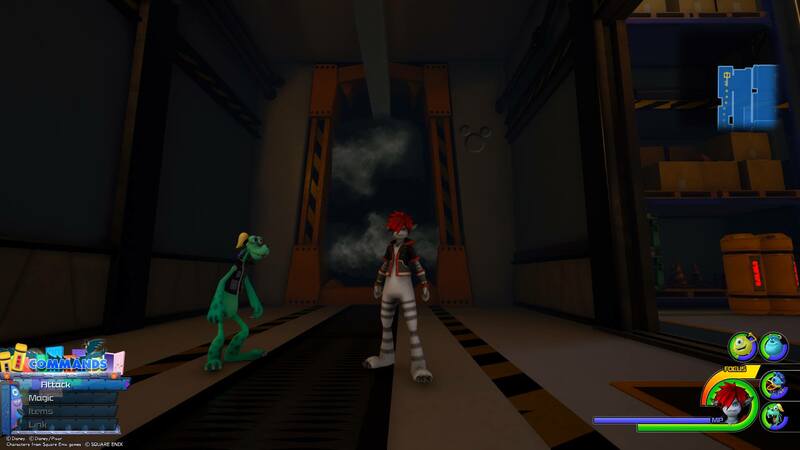 The next Lucky Emblem can be found after you ride the rails through the door area of the factory. When you head into the door area of the factory, you'll learn how to rail slide. After you hop off the second set of rails, you'll come to an area with another door you can enter. Before you do this, look for a short hallway behind you. Head in and at the very end, you'll find the third Lucky Emblem in Monstropolis. The fourth Lucky Emblem can be found by entering a secret door in Monstropolis. The fourth Lucky Emblem is the hardest one to find in Monstropolis. 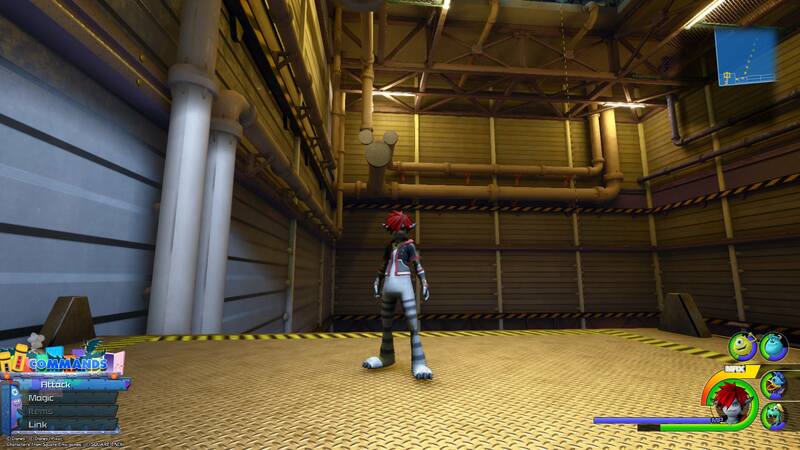 After you collect the third Lucky Emblem and proceed into the next area, you'll exit from a large wall of doors. Rather than heading forward into the corridor, take a right while staying in the door area. At the very end of the wall, you'll find another door you can interact with. 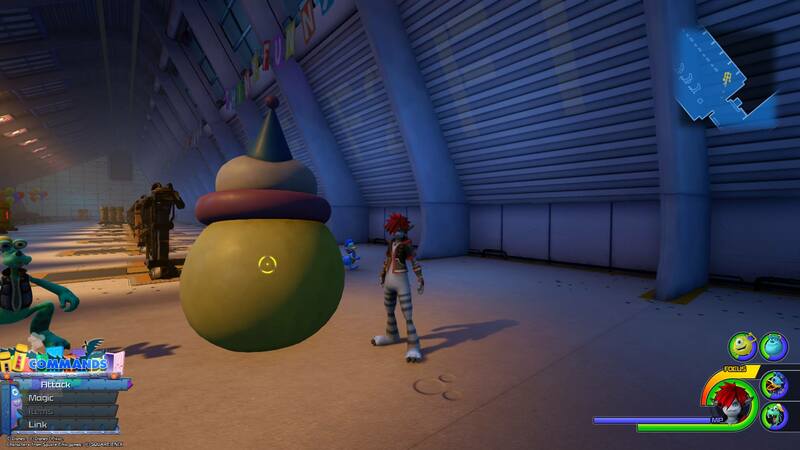 Enter the door and then turn around until you spot a large banana (one of the Flantastic 7 mini games in Kingdom Hearts 3). Walk past the banana and look out over the edge at the wall to spot the fourth Lucky Emblem comprised of yellow doors. As you can tell in the image above, this one is huge and hard to miss! After getting past the lasers, look at the window at the end of the stairs to find the fifth Lucky Emblem in Monstropolis. When you return to the main area of Monstropolis, you'll have to get past a set of rogue lasers. With that out of the way, head down the stairs and to your right, look underneath the window. There, you'll find the fifth Lucky Emblem. 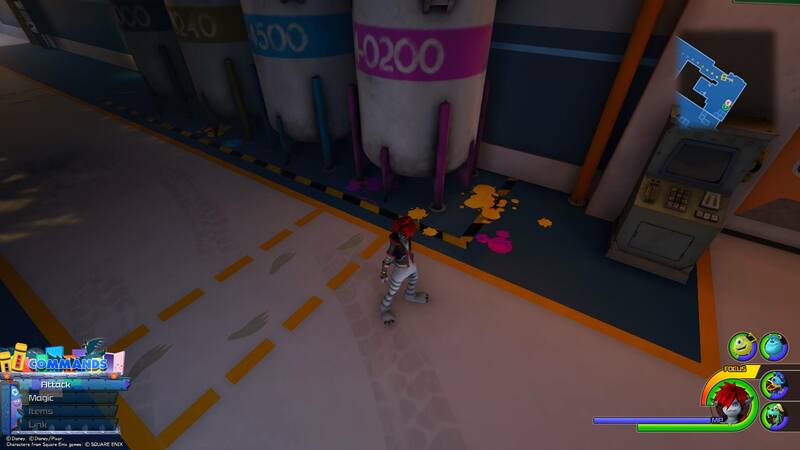 Head forward to the paint area and look near some of the metal containers to find a pink Lucky Emblem on the floor. After capturing the fifth Lucky Emblem, head forward towards the paint area. On your left, you'll see several large metal containers. On the floor near the last containers, a Lucky Emblem can be found made out of spilled pink paint. Keep making your way through the factory and near the Ground Floor save point, explore the assembly line doors. Near one of these doors, you'll find the seventh Lucky Emblem. Another Lucky Emblem that's tricky to find is the one seen in the image above. 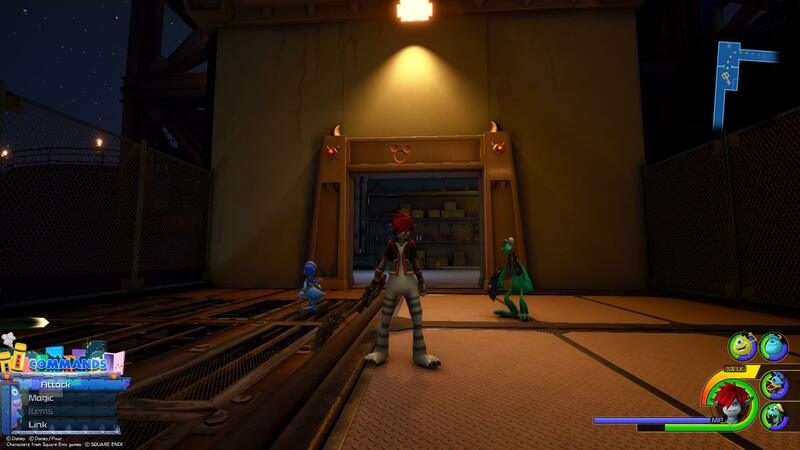 From the Ground Floor save point in Monstropolis, enter the factory and explore the assembly line conveyor belt areas. At the end of each of these conveyor belts is a door. Look near these doors, and you'll find one that has a Lucky Emblem on the upper right corner. When you reach the Power Plant save room, look at the desk with the hard hat on it. On the side of a cabinet, you'll find the eighth Lucky Emblem. Inside the Power Plant save room, look for a desk along the wall with a blue hard hat on it. Approach the desk, and on a metal filing cabinet to the left of the desk, you'll spot the eighth Lucky Emblem in Monstropolis. Head through a series of brick corridors up to the roof and when you reach the top, turn around and you'll see the ninth Lucky Emblem. With the Power Plant save room out of the way, head forward through the factory until you reach a brick corridor. Make your way through this corridor, then again through a second corridor as you head towards the roof. When you reach the top, turn around and at the top of the doorway, you should be able to find the ninth Lucky Emblem in Monstropolis. Fall from the roof into the next area of the factory. In this large room, there's a platform along the back of the wall that you can climb up. Looking forward from this platform, you should spot the tenth Lucky Emblem. When you plummet down into the factory from the roof, you'll find yourself in a large room. Straight ahead, there are several crates leading up to a platform. Climb these, and looking straight across from the platform, you'll see the tenth Lucky Emblem comprised of several connecting pipes. In the Vault Passage area, climb up the metal stairs and approach the CDA Agent. Stand to the right of the CDA Agent and look down at the floor below. There, you'll find the last Lucky Emblem in Monstropolis. 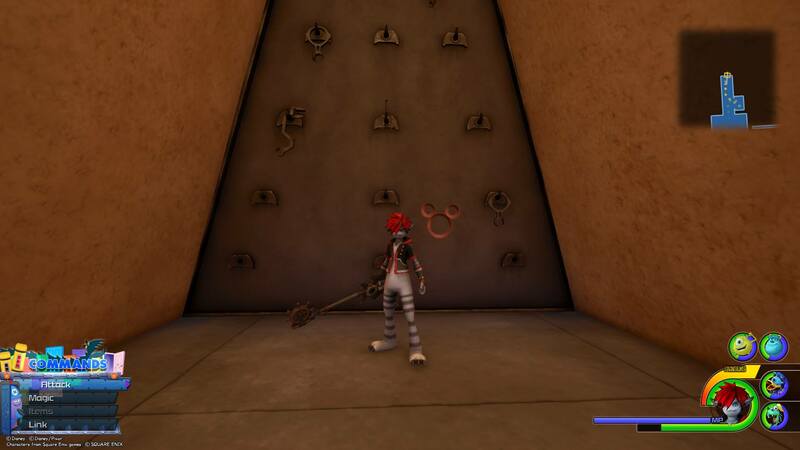 The last Lucky Emblem in the Monstropolis world of Kingdom hearts 3 can be found in the Vault Passage area. After climbing a set of metal stairs up towards a CDA Agent, stand to the right of the CDA Agent and look down at the floor below. There, you'll see the eleventh Lucky Emblem made up of spilled oil. By finding and photographing all 11 Lucky Emblems in Monstropolis, you’ll be that much closer to unlocking the secret video for Kingdom Hearts 3. Plus, the more Lucky Emblems you photograph, the more in-game rewards you’ll earn. So, were you able to find all 11 Lucky Emblems in Monstropolis? Which Lucky Emblem was the hardest to find? Let us know down in the comments below! For more on Kingdom Hearts 3, be sure to check out our previous Lucky Emblem guides including where to find all 9 Lucky Emblems in the Kingdom of Corona world of Kingdom Hearts 3, where to find all 11 Lucky Emblems in the Toy Box world of Kingdom Hearts 3, and where to find all 9 Lucky Emblems in the Twilight Town world of Kingdom Hearts 3.